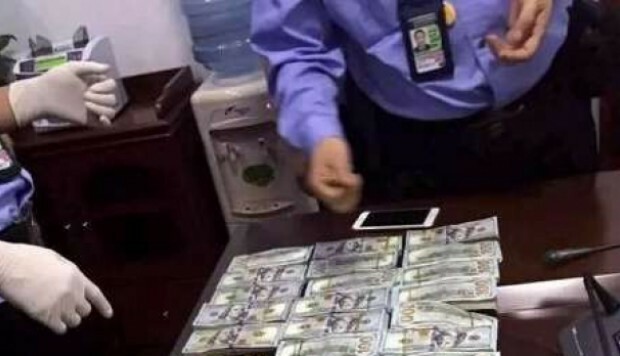 On Friday, two Chinese migrant workers were heading back home when they came across a bag containing more US$356,000 in cash on the ground at an airport in southern Guangzhou in Guangdong province. They turned the money over to police, mainland Yangcheng Evening News reported. The wads of US$100 bills belonged to three tourists from Ethiopia, who were so grateful that they kneeled down to say thank-you to the Good Samaritans, the report said. Peng Xiaoliang and Hu Guohui, both from rural Hunan province, spotted the white paper bag lying outside a gate of a major terminal at Guangzhou Baiyun International Airport, where the pair were employed as construction workers. Thinking that the bag’s owner may soon return to reclaim it, the two opted to stand guard beside the money and wait. But no one showed up. After a while, Peng and Hu decided to open the bag to see if they could discover any contact details about the owner. They were stunned to discover neatly stacked US$100 bills, probably the largest sum of cash they two migrant workers had seen in their life. Without hesitation, the two turned it over to the police, who later counted the cash. While Peng and Hu were making their report at the police service point, the three Ethiopian tourists rushed to the same place, desperate to find the bag. The trio, who later were confirmed to be the owners of the money, were seen kneeling down to Peng and Hu as a token of their appreciation.